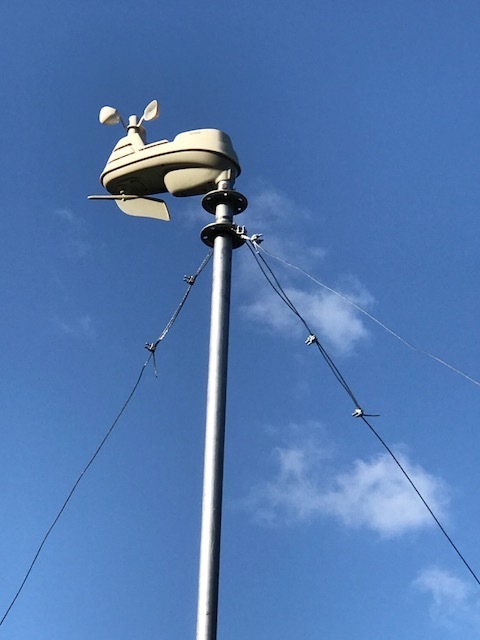 We have the AcuRite Wireless Weather Station 01517, kind of a “middle tier” station that includes wind and rain gauge, but does not use Wifi or connect to the Internet to report data. It talks over radio frequency to a base station inside the house which has about an 8 inch LCD color screen for monitoring data. While not a real high end (or real expensive) unit, it has a ton of features like tracking record and recent highs and lows as well as predicting weather after it “learns” general air pressure in the installed location. We’ve been really happy with it, and it seems to run a long time on 4 AA batteries, communicating data back to the base every few minutes. Its weather predictions are pretty accurate (not too far in advance, however). We had mounted it to the house on our deck, which creates accuracy problems with wind speed and direction. Everything else was fine, but I wanted to mount it away from the house to get it away from wind deflection a large structure causes. 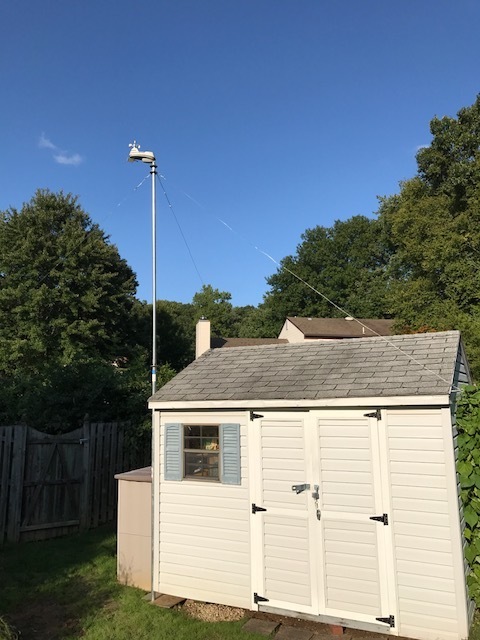 My brother-in-law suggested a ham radio mast as something affordable and easy to install. So, here are the parts I used and how I mounted it. The mast I selected is a Channel Master CM-1830 telescoping mast. It is made up of three 8 foot sections of galvanized steel with guide-wire mounting points on the top of the sections and bent bolts to lock the mast sections when extended. As such, you could use this for 8, 16, or 24 foot applications. When you look at competing products you will see a number of them, and many of them have very negative reviews. I think this is from going cheap and not noticing some of the products are fiberglass construction which has way too much flex if you don’t use guide-wires. This unit is definitely sturdy enough to carry a bit of weight, although when extended there is only a few inches of overlap inside the sections and they do lean a bit when extended. For right now I have it mounted 16 feet with one set of guide-wires. Instructions recommend guides at each section, and after lifting into place I would agree. While its on the ground it seemed like it didn’t need it – the sections are thick and strong. However, when extended you can see the play in the mast. If you check on Amazon you’ll see recommended a bottom mounting plate to create a stable platform. 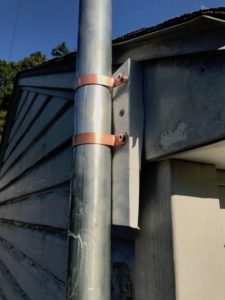 I went cheap as it was another $30, but might be worth the price if you are planning on leaving the mast installed a long time. Instead of a real base mount, I used a two foot section of epoxy coated rebar I found at Home Depot for 2 or 3 bucks. The ground is pretty soft in the location because of a drainage problem, so I used some paving stones and tile to create a flat, strong surface and prevent the mast from sinking into the ground. At the top of the shed (about seven foot up) I mounted the mast to the shed using clamps I found in the plumbing section, copper clamps for 2 inch pipe. I had purchased this before the mast showed up, they are a little small for the job as you can see…they are not quite flat against the wall. But they hold it tight. I mounted a small piece of wood wrapped in vinyl to get the pipe out away from the flashing on the shed. This was just scrap wood that I wrapped with exterior vinyl tape (3M white) so I didn’t have to paint it or worry about wood rot. I need a step ladder to get to the top of the first section. When I have to replace the batteries I can lift the post up a little and pull out the bolts that secure the extension, then slide it down where I can easily reach the sensor. I marked the location of things so I can raise it back into position and find the holes easily. Its a little heavy, but I didn’t think it was trouble to deal with manually raising and lowering the mast. I’m only pulling out one section to get it to 16 foot. If I decide to raise it higher I’ll need to attach another set of guide wires and make sure I raise the highest section first. I also needed to orient the weather station so it faced south. There is a small solar cell that runs a fan to circulate air though the weather sensor when the sun beats on it, as well as making the wind direction indicator orient correctly. Once it was spun into the right direction I tightened down the clamps on the top of the shed to keep it from spinning. Mounting the unit on top was a little rigged. The sensor came with a plastic mounting bracket that fits into a small hole on the bottom, about 1.5 inches in diameter. This wouldn’t work with the mast. The antenna mast is for an antenna (duh), which usually come with their own clamp to grip the outside of a mount. I purchased a small piece of PVC water supply which was 1 inch inside diameter and the outside was about a perfect fit into the whole on the sensor bottom. Two small holes on the sensor were guides to drill and two small screws to hold it in place. The PVC pipe was two feet long so the sensor wasn’t going anywhere once the pipe was slid into the top of the mast. However, it could spin out of orientation like this. I drilled a small hole in the side of the top of the mast to take another screw and hold it in place from rotating on the mast. The guide wires are from a 100 foot piece of 20 gauge galvanized cable, about $10. The small cable clamps are from the hardware store. You normally use a small metal ring for the cable to ride across to prevent wear, but I couldn’t figure out how to get it through the holes of the mast ring (you can see there are two rings above because I didn’t extend the top section). I figured the mast ring was smooth enough, but time will tell. I cut the cable into three sections while the mast was not extended and attached one end. Then I extended the mast and attached the other ends to three heavy duty screw eyes I mounted on edges of the shed and a fence post to triangulate. I went around a few times to tighten the cables prior to final tightening to check the mast was a level as I could get it. I don’t think its super-important, but gave it a good shot. There’s the finished job. Sturdy, away from the house, not too much of an eyesore (a matter of opinion, of course). If I decide its still interfered with by the shed I can crank it up another eight feet. From a weatherman’s perspective I’m sure they would say its still to close to structures, but this was the furthest away I could get it and still have it in range of the base station and not have to look at it from the back of the house. About $150 in parts (not counting the weather station), and I can take most of it with me if I move. Its all galvanized steel so it should hold up to the weather. The one improvement I would do would be to attach cable turnbuckles so that I could tighten the guide wires a little more.